50 years of beautiful marriage deserves 50th Anniversary Glass Personalized Picture Frames to remember this glorious event. 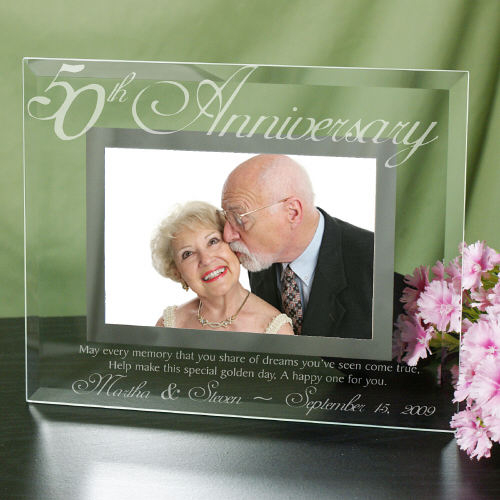 Present your Mom & Dad or Grandma & Grandpa with their own Engraved 50th Wedding Anniversary Picture Frame displaying their wedding photo for years past. These Engraved 50th Anniversary Customized Picture Frames come in two great sizes. Choose either our 9" x 7" frame that holds a 3.5" x 5" or 4" x 6" photo or our 8" x 10" frame that holds a 5" x 7" photo. Easel back allows for desk display. 50th Anniversary frame includes FREE Personalization! Personalized 50th Anniversary Picture Frame includes anniversary couples names and anniversary date. May every memory that you share of dreams you've seen come true, Help make this special golden day, A Happy one for you. Available in two great sizes. Choose either our 4" x 6" frame or 5" x 7"
Easel back allows for desk display. The etching is very light which makes it difficult to read the personalization. Beautiful!!! It arrived very quickly also... Thanks for helping make my parents big day even greater!!! Browse more Anniversary Gifts to find the perfect gift to give your spouse to commemorate your love and commitment.